Launched back in 2015, Wintika is an online casino on the HighWeb Ventures platform, and is treated with scepticism by some due to its odd maximum winnings clause and some other terms and conditions that make certain players uncomfortable. However, unless you are a high roller who bets huge amounts, the chances are that these won’t affect you, but it’s definitely worth familiarising yourself with Wintika’s terms and conditions before choosing to sign up, advice that should be followed when considering joining any online casino site. Another thing to be aware of, is that Wintika is not currently available to UK players, but many outside the UK can enjoy this casino, which is licensed in Curacao. 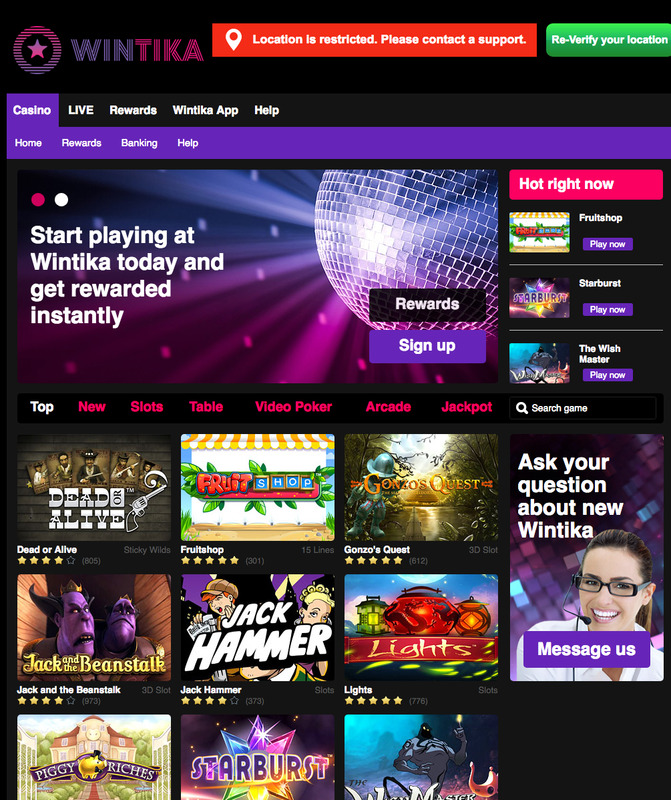 Wintika is a funky looking site, relying on colour and style to make an immediate impact, which is far from a negative, first impressions are rarely as important as they are in the online casino industry, and Wintika makes a good one. But looking past the aesthetically pleasing nature of this site, what else is there on offer to tempt players in? Because a good look will only get you so far in this competitive industry. We’ve seen many online casinos that look good, have little substance to back up the pretty pictures, is Wintika just another one of these? Or is there enough depth to this site to keep your interest? We’ve told you it’s a good-looking site, now let us tell you why! With a neon pink and purple colour scheme contrasted (necessarily!) by a hefty dose of black, to avoid the colours becoming too invasive or unpleasant, this site is nothing if not eye-catching. Speaking of eye-catching, the welcome bonus takes pride of place on the homepage here, understandable, as (at the time of writing) it offers up to €200 to new players who are joining the site. To get to the traditional thumbnails to popular sites, you have to press the casino button, which may not seem a big thing, and to most, probably isn’t, but players are so used to instant access by this point, that any additional steps, no matter how small they may be, will probably make certain players hesitant, especially considering how many quality sites do not make you go through this one tiny step before accessing their content. This can be looked past though, as the combination of neon lights, and a black background that allows the artwork from the games in the thumbnails to provide the design without being too much, makes this site look great. A long list of software developers providing the games is something that most online casinos necessitate at this point, but it isn’t what Wintika has. Instead, this site offers a small, but intriguing list including a few names you won’t find at many other sites, with the full list consisting of GamesOS, iSoftBet, Microgaming, MrSlotty, NetEnt, Playson, Playtech, and Pragmatic Play. It’s nice to have something different, and it’s hard to argue with the fact that there is a strong collection of games here that vary greatly in design, concept, and gameplay. However, that probably isn’t enough to make up for the small number of names on the list, including these names creates that feeling of freshness, but without a few more heavy hitters on the list, it is unlikely to appeal to many players when you consider the abundance of developers that provide the titles at most successful sites. All in all, Wintika feels like an online casino that doesn’t quite do enough to back up it’s attractive look, and that’s a real shame.